I hope you had a wonderful 2013. The Milgard School of Business wishes you and yours happy holidays and a wonderful 2014. Several new students will be joining the program starting Winter quarter. You may recall that we now admit students twice a year, in Autumn and Winter. A team of enthusiastic MBA students have formed an MBA Association and they are reaching out to alumni as well. They had their first event (a Wine Social at El Gaucho) earlier in the year and are organizing a holiday party at the Museum of Glass on December 6th. We hope you utilize this as another avenue to remain connected in addition to attending the school sponsored events such as the TGIF’s, networking event, and executive speaker series. 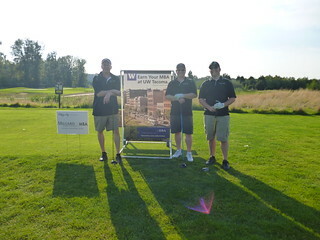 Please read on to catch up on events and happenings at the school and news from our MBA community. As always please send us your updates to be featured in the newsletter. On Thursday, October 24th, the Milgard School of Business MBA hosted their quarterly Executive Speaker, Carlyn Roy, CEO of Tapco. 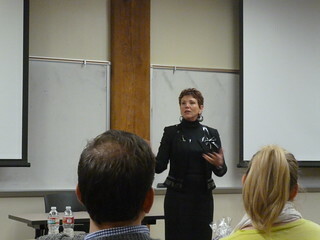 Carlyn focused her presentation on key learnings she has discovered throughout her career. Carlyn earned her bachelor’s degree in Elementary Education from Pacific Lutheran University. She spent a year teaching first grade in the Tacoma school district while her husband finished earning his degree. After his graduation, they made the decision to move to Portland for a job opportunity that he had. Carlyn was not credentialed to teach in Oregon, her plan was to work part-time and take the additional courses she would need to get certified at Portland State. She began working part-time as a teller at a bank and was soon offered a full-time position and never enrolled for those additional courses. 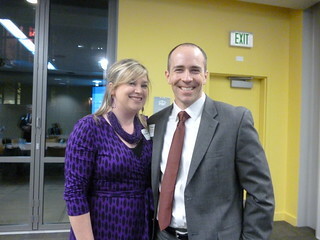 After a few years, her husband accepted a position in Tacoma and they moved back to Washington. Carlyn’s plan was to teach again, but she and her husband were trying to buy a house in the middle of a housing crisis and she needed proof of employment by August 15th and teaching contracts were not going to be offered until after Labor Day, so she decided to pursue other options and was hired at a local credit union. Those early years are the story of how a first grade teacher ended up on a career path towards CEO. As she progressed through her career, Carlyn also found the importance of maintaining a strong professional network. Having mentors in the field who she could turn to when faced with a new challenge at work and having a network of individuals she could turn to when she was looking to fill positions. She also suggested taking the time to work your network for the benefit of someone else-the effort is always returned and appreciated. During her 13 years at OSU Federal Credit Union where before leaving she served as Executive Vice President and COO, Carlyn lead a change in the credit union employees’ vision of themselves as order takers to problem solvers. Carlyn’s goal was not to become to a CEO-she had a friend in her professional network who for years suggested it to her as an option. One day she took a phone call from a head hunter she spoke with occasionally who told her about the CEO position at TAPCO and mentioned he felt she was one of two people in the country who could do this position. She decided to interview for the position. She conducted extensive research, it was 2011 and she noted that TAPCO had not been profitable since 2007. She knew that to be prepared for her interview, she would need a strategic plan that she believed in. Her research then expanded to lengthy discussions with CEOs in her professional network who would look at the data with her and give her feedback on her ideas. When she interviewed for the position, she informed the credit union board of her strategic plan and told them that if she was hired she would ask that they give her three years without their interference. She went in the interview process not sure that she really wanted the CEO position; then when it was offered to her, she still was not sure and asked for everything she could have wanted. In hindsight she discovered this was another learning experience, she felt that if she had known all along that she wanted the position, she would not have asked for everything that she received and ultimately short changed herself and her abilities. Coming into the CEO position was terrifying. She entered into a position the previous CEO held a number of years; the average employee had worked there for 20 years and the COO had been there for 40 years. New CEOs face a decision when they begin to either clean house and bring in a new staff, usually of people they worked with previously or give all current employees a chance to prove themselves. Carlyn made the decision to keep the current staff and took time to meet and shake hands with every employee. She built trust by letting them know she would not review employee files and that everyone had a clean slate to prove they were willing and able to move forward with changing the direction of TAPCO. She spent time getting to know the key players and asked a lot of questions. She made sure that employees were aware of the financial situation of the credit union-this was a new level of transparency for many of them. Her communication informed the employees of the new direction and challenges faced and gave everyone the opportunity to decide if they wanted to be part. Her goal was not to eliminate employees, but rather to have employees decide on their own if they were no longer a fit for the organization. Donald L. Clark Jr. was born in Brazil, where he spent most of his childhood. When he decided to pursue a college education, Don received his bachelors of science in accounting at the Marriott School of Business at Brigham Young University. Since graduating, he has become a certified public accountant (CPA) and has gained just over 20 years of experience in the credit union field. That experience includes Asset-Liability Management, business lending, Credit Union Service Organization (CUSO) development, financial reporting, risk management and strategic planning. Don has served on boards of various CUSO’s and associations such as Member Business Lending, LCC (MBL); the National Association of Credit Union Service Organizations (NACUSO) and the Products Research Organization for Credit Unions (PROCU) to name a few. Don was named Executive Vice President/Chief Risk Officer of Sound Credit Union during the summer of 2012 just prior to starting the UWT MBA program. He returned to Sound after 14 years with various other companies, and is now responsible for overseeing their finance, information systems, investment and retirement services, and risk management. Don made the choice to pursue his MBA at UW Tacoma after being encouraged by Sound’s CEO and board, who felt that it would be beneficial for him to learn about new trends, research, marketing strategies and organizational development studies currently being taught. So far he has been enjoying the program, and feels that it has been extremely valuable for his professional experiences. Throughout his career, Don has balanced work with raising a family of 6 children. His kids range in age from 8 to 23, and he also has 2 granddaughters. When he is not working, Don enjoys spending time with his family and taking them on vacations to warm destinations. Don is also a lover of music and has been playing the drums since the seventh grade. He has performed with numerous bands over the years, some of which helped him pay for his college education. He still continues to play the drums today. If not behind his drum set, you are likely to find Don on the golf course, sharing his love for the game with his sons. As two of his sons are finishing out their high school years, and three more of his children have already graduated, Don, along with his wife, is looking forward to raising his last daughter in the Pacific NW while enjoying his return to WA and the Sound Credit Union family. Douglas Stoddard began his education at the Wharton School of Business in Philadelphia. He graduated with a degree in International Finance and East Asian Studies with a focus in Japanese language. His interest in fixed income and derivative securities attracted him to Lehman Brothers, an investment bank known at the time for leading the industry in bonds and structured securities. Although he found the fast-paced and innovative work at Lehman Brothers intellectually stimulating, he realized quickly that he needed to pursue a career with a greater focus on helping others. 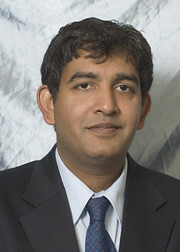 As a result, he left Lehman Brothers to return to the University of Pennsylvania and pursue a medical degree with the goal of becoming a military doctor. It was at Penn that Dr. Stoddard met Trauma Surgeon and Army Reservist – Dr. John Pryor – who inspired him to pursue a career as an Army Surgeon. Board certification in General Surgery requires five years of clinical training with optional years for dedicated scientific research. Clinical residency schedules are rigorous, with 80-hour workweeks and call days routinely lasting 30 hours at a time. General Surgery residents generally spend their research time pursuing basic science questions or clinically focused topics. Dr. Stoddard saw the research year as an opportunity to do something different; to leverage his substantial financial background to improve the way that the military health system conducts the business of surgery. He proposed projects that focused on resource utilization, hospital and health system business models, and finding ways to improve access to surgical care for military beneficiaries and their families. Dr. Stoddard’s initial research identified substantial opportunities for improved efficiencies and cost savings for Madigan Army Medical Center that totaled in the millions of dollars for fiscal year 2013. His success at Madigan generated additional opportunities for him to join ongoing efforts to improve Surgical Services for the entire Army. He was granted a second year of research to participate in standing up the Army Surgical Services Service Line (3SL) at the Office of the Surgeon General of the Army (OTSG) in Virginia. The 3SL is part of a broader effort in the military health system to standardize and centralize the delivery of health care. Doing so will improve and transform the delivery of Army surgical services to ~4 million beneficiaries across 25 medical centers in the United States and Europe. His supervising officers recognized the utility of Dr. Stoddard pursuing an MBA, and have supported him in those efforts as well. He chose to study at the University of Washington Tacoma campus because it offers a curriculum that fits his busy lifestyle better. 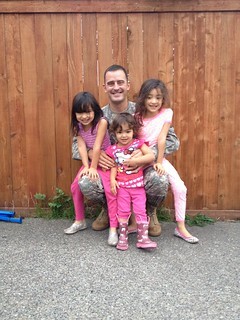 Dr. Stoddard juggles his professional work with being a father to three beautiful daughters, pursuing his MBA here at UWT, and slowly checking items off his bucket list (like learning jazz piano). He sees tremendous untapped opportunities in both federal and civilian health system models to improve delivery and access to healthcare, and is excited to participate in changing the paradigm of healthcare delivery in the future. “What a great time to be in the health care industry!” he says, “Our hospitals are filled with talented and passionate professionals who dedicate their lives in service to others. Unbelievable technological and scientific advances over the last few decades have equipped our care teams with the tools to bring high quality care to more people than ever before. There are a lot of great things in the pipeline for American healthcare.” It will take individuals trained in both clinical and administrative medicine to successfully lead health systems of the future, and Dr. Stoddard is a great example of that new type of leader. John Jackson was a proud participant of the Operation Enduring Freedom combat operations during his service with the U.S. Navy from 1998-2002. Directly after finishing his four years in the Navy, he jumped into his college career by earning an Associates of Arts Degree from Pierce College. He then transferred to Western Washington University where he earned his Bachelor of Arts Degree in Business Administration. While in school for his bachelor’s degree, John was also working as a marine electrician for M.D. Marine Electric in Tacoma. He was promoted to Manager before graduation, and then chosen to be Vice President just three years later. During John’s time at M. D. Marine Electric, the company grew rapidly. By 2010, they had reached $10 million in sales and were up to 65 employees. 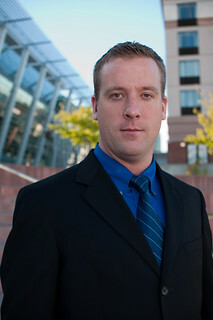 Looking for the credibility of a master’s degree and ways to deal with the newly found complexities of his job, John made the decision to get his MBA from UW Tacoma. He graduated from the program in 2012, and has recently purchased Harris Electric, an electrical contractor that specializes in the marine industry. “On June 3rd, 2013 I began my first day as President & CEO of this 86 year old company with 75 employees and $20 million in annual sales. I have so much to learn but I think I am uniquely qualified for this position and bring a lot of energy, ideas and experience to the table. I am still the vice president of M.D Marine Electric in Tacoma as well, so things are insane at the moment!” Harris Electric’s main headquarters reside in Seattle, adjacent to the Lake Washington’s ship canal. The company also has a branch out of Dutch Harbor, Alaska which gives Harris reach to cover the North Pacific region. Since earning his MBA from UWT, John has noticed an increased amount of both respect and opportunities from fellow business professionals. His advice to those currently in the program would be to really develop their network through keeping in touch with classmates. John has been able to share in his success with former UWT classmates, and wants to encourage other graduate students to do the same. 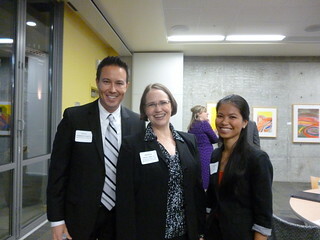 On Monday, November 18th the Milgard MBA hosted the 4th annual Milgard Networking Event. 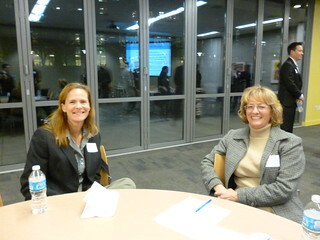 The format was similar to previous events with a speaker and multiple rounds of speed networking. This year’s speaker was Joe Lawless, MBA 2007 and Executive Director of the Milgard School Center for Leadership and Social Responsibility. Joe’s talk focused on the effective use of Linked In for professional networking. Make sure your profile is current and complete. A complete profile is one where all sections are filled out and contains at least 2 recommendations. Be active on Linked In. Post interesting articles and comment in your groups, this shows your connections that you are active and engaged. Use a personalized message when sending a request to connect. For additional Linked In tips review this online infographic. Q&A with Dr. Kent Nelson, Ph.D.
1. 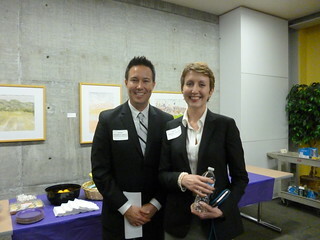 Dr. Nelson, when did you begin at the University of Washington Tacoma’s Milgard School of Business? A: Circa 1998 as a full-time faculty member. Prior to that I taught as a part-time (adjunct) lecturer at UWT for a couple of years while also working as a management consultant. 2. What about the Milgard School of Business attracted you to this very young (est. 1994) program? A: The opportunity to build something from the ground up as part of the UW system. I did my graduate (master’s and doctoral) studies at UW Seattle and I was excited by the opportunity to be a part of the UW as a faculty member, to apply what I had learned in my graduate work and be professionally affiliated with this great educational institution. In contrast with UW Seattle, the UW Tacoma campus (and business program) was obviously small and in its infant stages at the time I joined, and this was a rare chance to help with important institution-building to shape the direction and influence of the business program. 3. Tell us about your professional experience. A: My experience in academe has largely focused on teaching and institution-building here at UWT. I have also connected with the community by sharing my scholarly interests in the form of training/development workshops, executive education, speaking engagements, and consulting projects. I have remained pretty active with businesses in the S. South region through my speaking and training/development engagements. Prior to attending graduate school, I worked at a marketing communications firm, developing marketing and sales promotion programs for mid-to-large sized companies. 4. Could you tell us about what you are currently researching? A. My main interest is about social toxicity in organizations, specifically toxic leadership and toxic relationships. I study the various “profile” characteristics of what I call “toxic abusers” and “toxic victims,” as well as the way people co-create toxic relationships that are damaging to an organization’s culture and climate. I’m interested in the ways toxic leaders gain power and control in organizations, how this control is perpetuated and manifested, the impact it has on others, and ways toxic leaders can be dealt with. Relatedly, I’m interested in “crazy-making” communication strategies that toxic people use to manipulate others in the pursuit of self-serving interests. 5. What made you choose academia? A. My original intent when attending graduate school was not to pursue an academic career path. At the time I was more interested in the applied work of consulting. But when the opportunity arose I felt it would be a great way for me to use my knowledge and skill sets in a setting where I could still have a direct influence on people’s lives. The previous work I had done in marketing communications and management consulting, while interesting and rewarding, was also very stressful and demanding in ways I did not enjoy. So the move to academe as a Senior Lecturer who focuses on teaching and learning was a natural opportunity. A. I worked as a D.J. (disc jockey) in college (my undergrad degree) at a radio station, and also as a reporter and announcer in the news room. I originally wanted to be a sports journalist, and working in radio gave me the chance to cover high school and college sporting events, as well as local news. I covered local events (including but not limited to sports), conducted interviews, wrote copy, and worked as a broadcaster. Probably the most fun I’ve ever had in a job. 7. If you do not mind sharing, what are some activities you enjoy outside of work? A. I love being active outdoors, especially in the mountains and wilderness – hiking, climbing, camping, fishing. I also enjoy spending time with my wife traveling, taking road trips (etc). I love playing and watching sports, and attending all kinds of live performances such as theatre and music. 8. Tell us something we would be surprised to know about you. A. I’m a classically trained musician. I paid for my undergraduate education on a music scholarship playing the French horn. I have played with the symphony and pit orchestra’s in musicals. Also, I used to manage rock bands and I still love going to rock concerts. 9. Do you have any advice for students as they strive toward earning their M.B.A.? A. build lasting and meaningful relationships with others in the program. Learn from others and contribute to the learning of others by sharing experiences. And don’t limit learning to the classroom – use the concepts as sense-making tools on a daily basis to explain experiences, predict trends, and exert influence in the workplace. 10. Dr. Nelson is there anything else you would like to share with the Milgard School of Business M.B. A. candidates? A. Immerse yourself in the experience and embrace all of the learning opportunities. It’s a lot of hard work, but don’t let that the keep you from being mindful and appreciative as you move through the program. It’s easy to get caught in the rut of just going through the motions and simply focusing on finishing the degree. But this is a wonderful opportunity to grow personally and professionally that many people never get, so appreciate all that it has to offer.